Football has been hit by match-fixing scandals for decades. The dirty topic of match-fixing rarely casts an ugly shadow over football but when it does the impact of its shockwaves are felt throughout the sport. Here is a look at the top 5 match-fixing scandals that have tarnished the beautiful game. It remains one of the darkest periods in Italian football. The implications of the so-called Calciopoli were felt across Europe as some of the world’s most famous football clubs saw their reputations dragged through the mud. 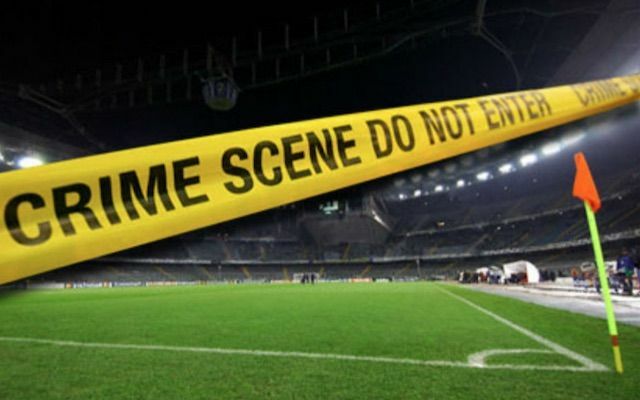 Italian authorities discovered evidence of match-fixing linked to some of Serie A’s top clubs including Juventus, AC Milan, Fiorentina, Lazio, and Reggina who had allegedly bribed referees in exchange for favourable decisions. The repercussions of the scandal were huge. Juventus were stripped of their 2006 Scudetto and relegated to Serie B. AC Milan were handed a devastating 30 point deduction for the following season. Fiorentina and Lazio received one year bans from European competition. Reginna were given a 15 point penalty for the following season and the club’s president Pasquale Foti was banned from football activity for two years and fined £20,000. The whole affair still leaves a sour taste in the mouth of many football fans throughout the world. Match-fixing has seldom hit the front pages of the British media but one occasion when it did was when Liverpool goalkeeper Grobbelaar was charged along with fellow professionals and Wimbledon players Hans Segers and John Fashanu of match-fixing. Two successive trials saw the jury fail to come to a conclusive verdict. The players were allowed to continue playing and all three fervently protested their innocence. After further investigation, all three players were cleared of any wrong doing due to a lack of evidence. Fortunately, this incident has not had a long-lasting negative impact on betting within the UK gambling industry. Football is still seen as the sport most popular with punters for betting online, on mobile, and in shop premises across the UK. One of the biggest issues for match-fixers to combat is getting players and officials on board to manipulate decisions and the eventual outcome. Over the past few years, match-fixing criminals have realised that there is not necessarily a need to even involved players or officials if you want to fix a game. In fact, you don’t even have to play a game! In 2015, two Belarusian sides in FC Slutsk and Shakhter Soligorsk were scheduled to play each other. Several bookies took bets on the game. Both club websites reported that the eventual outcome was a 2-1 win for the home side. Rumours soon circulated that the game had never taken place. Shakhter made a claim that their site had been hacked and the scam was eventually traced to a former employee from a data collection agency. Unfortunately, Italian football is once again the focus of attention for another match-fixing farce. This time it was a Serie C encounter between Cremonense and Paganese. Early in the game, Cremonense players began to suffer from severe lethargy. Some players were struggling to even walk during the game and one player crashed his car on the way home as he almost fell asleep at the wheel. The Italian FA investigated the game and traced the lethargy of the Cremonense players back to their drinks that had been spiked with tranquilizers by their own goalkeeper Marco Paoloni. After further investigation, it turned out that Paoloni, who was subsequently banned for 5 years, had been paid by notorious match-fixing crook and Singaporean businessman Dan Tan. If you want to discuss the most blatant examples of match-fixing in modern day football then we need look no further than the extreme case of the Plateau United Feeders and Police Machine goal fest controversy. The incident took place as promotion rivals entered the last day of the Nigerian football season with everything riding on the final matches. At half-time, eyebrows were raised as Plateau United Feeders had stormed into a 7-0 lead against Akurba FC while Police Machine held a 6-0 advantage over Babayaro FC. The unusual turned into the ridiculous in the second half. Feeders went on to win their game 79-0 and the Machine sealed a 67-0 victory. The Nigerian FA suspected foul play and after investigating the matches banned all four teams for 10 years.